Muroc- the legacy of Gyro Gearloose? 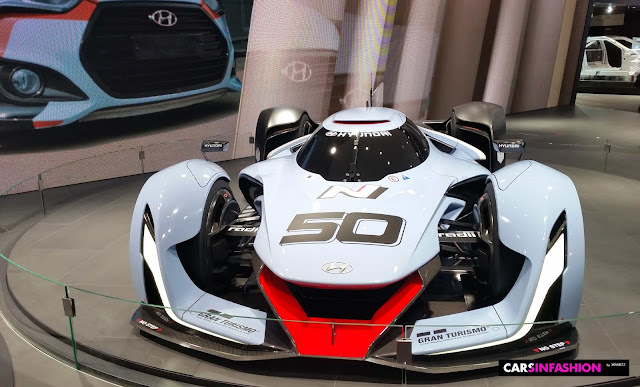 Stepping closer to the thrilling Hyundai N 2025 Vision Gran Turismo concept car one could think it was fine-tuned by Gyro Gearloose, the clumsy nerd of the comic series Donald Duck. Doesn't it outer shell appearance looks like an exciting breeding of a Jetfighter, Batmobile, shark or ground vehicle? Until now I didn't have the pleasure to listen to the sound of the Air blower Turbine, but in my imagination, it must have an undefinable powerful shrilling, earsplitting volume, something between a jet fighter and a vehicle monster. 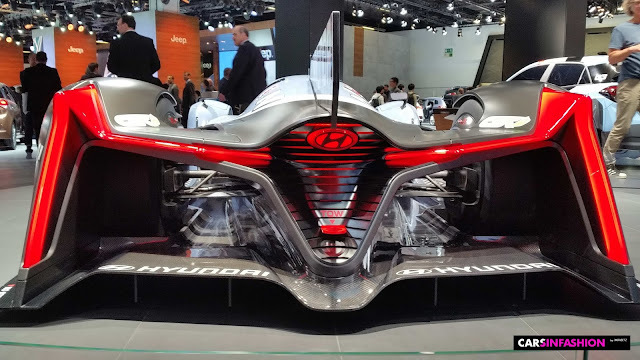 Let's count together: the Air blower Turbine spins at around 200,000 rpm, plus the frequency of fuel cell stacks, the gurgling sound from the hydrogen cooling system and the high-pitched in-wheel motor sound. Fasten your seat belts, close your eyes and start your imagination! Like Albert Einstein already quoted- "Imagination is more important than knowledge. Knowledge is limited. Imagination encircles the world." The Hyundai N 2025 Vision GT concept car is a lightweight racer due to its compact fuel cell stacks and a rigid CFRP monocoque structure which helps to keep its weight down to 972 kg. 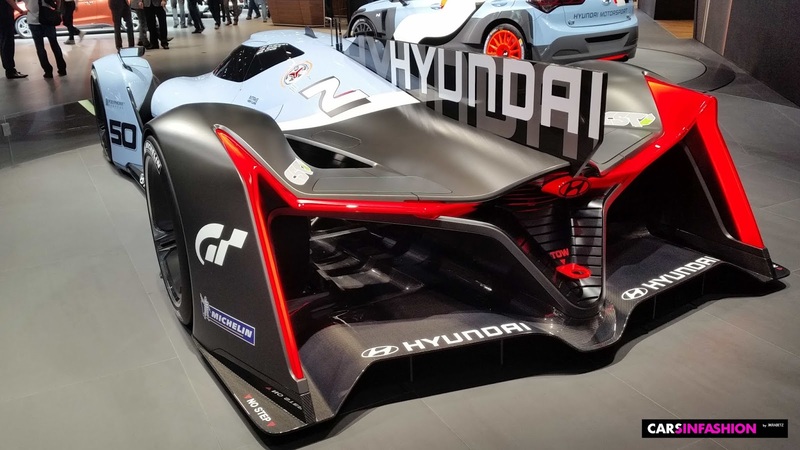 It represents the motorsport passion of Hyundai`s performance sub-brand "N". Another highlight is the air brake which is activated during high speed, providing braking action as well as reducing drag. 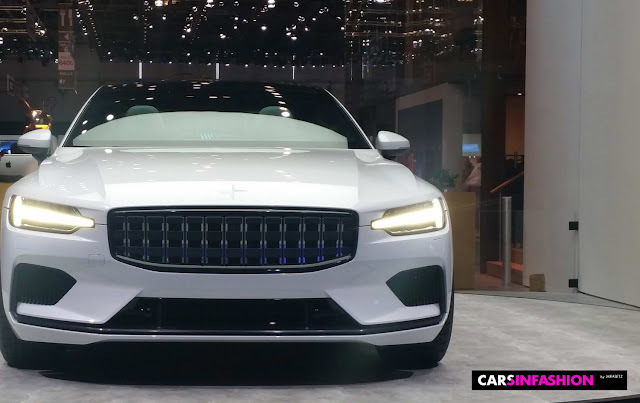 To produce maximum downforce, the air flows through the hexagonal grille to the boat-shaped chassis structure. It then flows on into the tube-type underflow air supply duct to the rear minimizes pressure and all the way to the underbody. 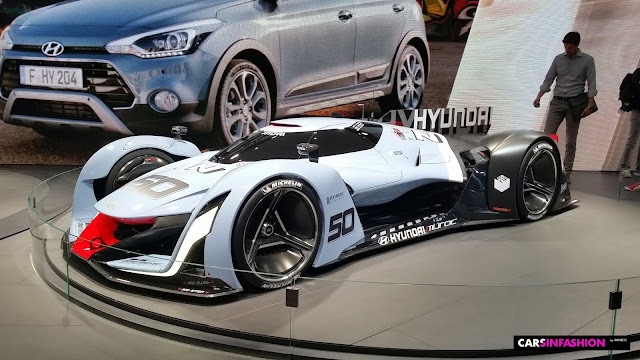 Hyundai`s spectacular N 2025 Vision GT vehicle is powered by a new type of drivetrain style- a mass-produced hydrogen fuel cell system which allows the concept car rumbling on track but also being environmentally friendly. 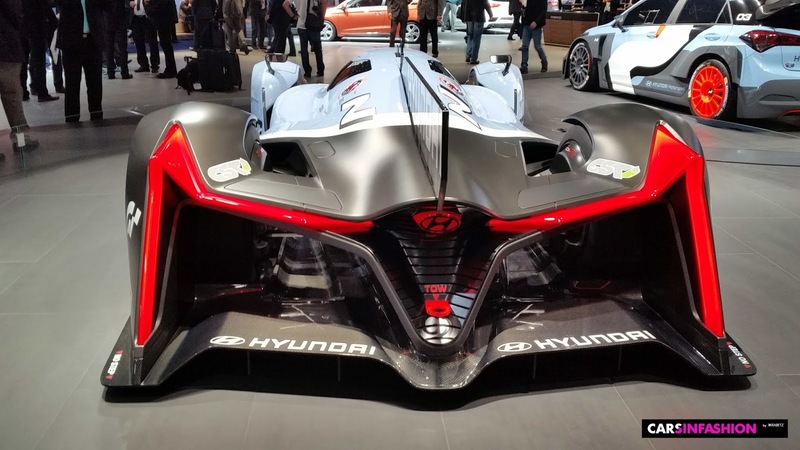 The total system output is about 650 kW (884 PS) and the dual fuel cell stacks provide 500kW (640 PS), the supercapacitor system adds another 150 kW (204 PS) by using energy regeneration while braking. The phenomenal power of 650 kW (884 PS) is delivered by four independent in-wheel motors. In my world, cars have their own first names, like my 84 VW bug calls "Nelli". Maybe the designers and engineers got the same idea when they took inspiration from aeronautics and the Muroc Dry Lake in the Mojave desert in California, US. They baptized the Hyundai N 2025 Vision GT concept car to its forename "Muroc". 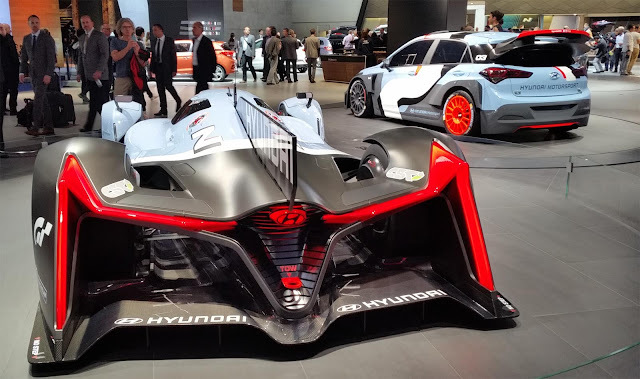 I was very pleasantly surprised when I spotted Muroc between the new arrivals on the Hyundai stand at the Frankfurt Motor Show in 2015. A stingray of a car as flat as a pancake which let me remember right away to Gyro Gearlose the technical wizard of Donald Duck! I liked the rear very much. The shape with red lines to the right and left, the glowing illuminating lamellar in the middle crowned by a tail fin reminds me of Batman's racing toy or a U-boat type in some James Bond Movie. 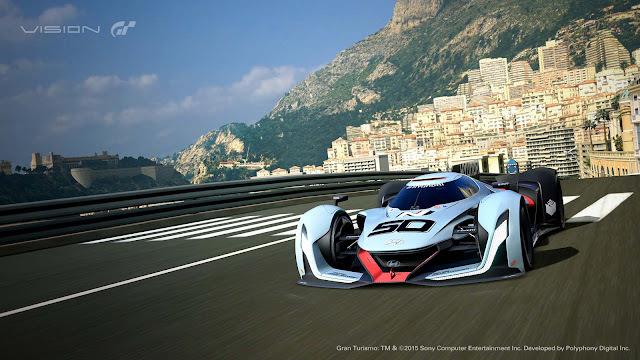 Now the most important question of this century when it comes to exciting concept cars:" Is this beast only a design study dammed to race forever in the PlayStation game Gran Turismo or will it become one-day reality and populating our streets? 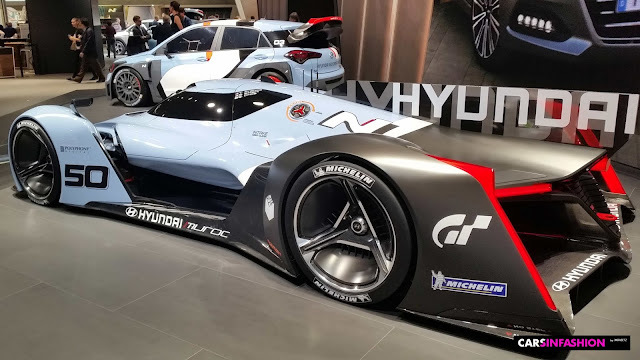 Forecasting the next powertrain technology generation, Hyundai`s Muroc fits perfectly with the past trend direction in autumn/ winter 16/17 (Munich fabric starts). The theme "Interface" Jumble" showed intelligent materials, individual customization and digital prints. To be sportive and fashionably dressed for riding such a beast I would suggest a style-mix of a coloured race suit with neoprene boots and gloves inspired by windsurfing, also sunglasses, soundproofed headphones and a helmet.